In his assemblage, installation, and wall works, Willie Cole (b. 1955) transforms ordinary, domestic objects such as hair dryers, bicycle parts, irons and ironing boards, high-heeled shoes, and lawn jockeys into powerful works embedded with references to the African-American experience and inspired by West African religion, mythology, and culture. The appropriation of discarded mass-produced American products, objects that have themselves acquired a "pre-history" through their earlier handling and use, become the raw material of Cole's creations. Drawing on his personal experience and collective cultural histories, his work is a playful, inquisitive, and intelligent approach to synthesizing the physical and spiritual worlds. The steam iron is certainly the single-most important icon in Cole's visual vocabulary. Within American culture, the iron is indicative of the house servant role of women of color and emblematic of domesticity in general. Iron is also a metal associated with industry and mass-production. In West Africa, the iron takes on male rather then female associations. In the Yoruba culture, for example, Ogun, the god of iron and war, is the patron deity representing male power, weapons, and fertility. He serves all who use metal in their occupations such as blacksmiths and warriors. Cole's playful approach to the iron as a symbol and object has resulted in a litany of creative works, both sculptural and two-dimensional. For him, the imprint of an iron "point up" is equivalent to a face and references African masks (as seen in a series of Iris prints from 2002); "point down" it takes on the form of a shield. 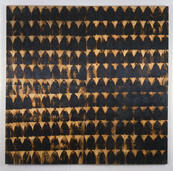 Using the iron as a mark-making tool, Cole has used the steam iron to imprint or "scorch" canvases, using the readily-identifiable iron shape to create beautiful and haunting patterns reminiscent of Andinkra stamped cloth, flowers, random patterning, and even to suggest the interior diagram of a slave ship. In Ghana, it is the men who imprint cloth with stamps of varying symbols, each with a specific meaning. In addition to presenting his canvases as a painting, Cole has also shaped the canvas onto ironing boards. Like the iron, ironing boards are doubly meaningful for Cole based on its orientation: placed vertically it is as a shield, horizontally, it is the visual equivalent of a boat. In the Bambara culture of West Africa, the antelope holds special significance as a mystical animal important in agricultural festivities. It is represented by "tji wara" (which means "working animal") and was important to increasing the fertility of the fields for a bountiful harvest. Cole's hybrids of bicycle parts are poetic and lyrical manifestations of both male and female (the female form is always presented in association with a child) tji wara. One of several installations that Cole has created is the recent To Get To The Other Side (2001). It presents a large floor mounted chess board on which game pieces comprised of embellished and transformed lawn jockeys are placed. A powerful work, To Get To the Other Side comments on the historical origins of the Jockey Boy statue as a revolutionary war memorial figure while simultaneously referring to Cole's inference that it is a contemporary stand in for the Yoruba God Elegba. Embellished with senses of hidden power or "ashe," each of Cole's jockeys becomes a unique fetishistic experience. "In tribal art mystery and secrecy become visual signifiers and unleash magical and spiritual speculation in the minds of its viewers," says Cole. "That's ashe... and that's getting to the other side". Funded in part by the Elizabeth Firestone Graham Foundation, the Norton Family Foundation, UW President's Advisory Council for Minorities' and Women's Affairs (PACMWA), UW Cultural Outreach, UW Art Department, National Advisory Board of the UW Art Museum, Wyoming Public Radio, the National Endowment for the Arts, and the Wyoming Arts Council through the National Endowment for the Arts and the Wyoming State Legislature.